There are only four places where you will need to enter your business transactions in Pandle. To make your life a little easier, we've outlined each one below. We have also provided links to more comprehensive articles which explain exactly how to enter transactions in Customers, Suppliers and Banking. From here you can create new customers and either enter or create invoices and credit notes you have issued to customers. This should only be used for customers you offer credit to i.e. customers who do not pay you straight away. Instant sales can go straight through Banking without the added step of creating a customer and an invoice. The Customers tab may not be visible to you if you specified that you do not offer your customers credit in the initial set up wizard. To learn more about entering customer invoices click here. This is identical to Customers except this manages the handling of your supplier invoices, rather than your customer invoices. Supplier invoices are invoices from your suppliers that have offered you credit, i.e. you don’t pay them straight away. For example, you might have an account with a stationery company where you order stationery and pay them each month. The invoices from that supplier should be entered here and the payments you make to them entered through the Banking tab. However, if you buy stationery from a physical stationery store you would simply enter those transactions in the Banking tab because you are paying straight away (no supplier invoice required). You may not be able to see the Suppliers tab in your account if you specified that your suppliers do not offer you credit in the initial set up wizard, however, you can toggle it back on under Settings. To learn more about entering supplier invoices click here. Banking is where all of your cash/banking transactions are entered. Here you will have a number of accounts including your bank accounts, credit cards, cash and PayPal etc. This is where you will enter the majority of your business transactions. When you click on the Banking tab, a list of your bank accounts and their balances will be shown. 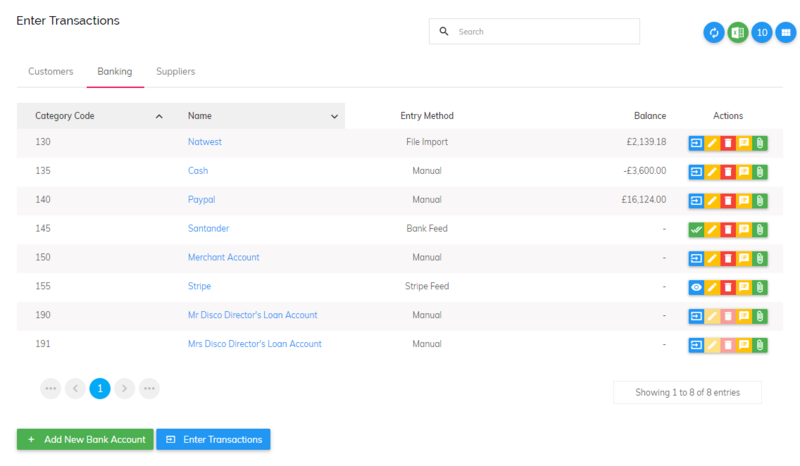 In the example below you can see this business has number of different account types including a Natwest bank account, a cash account (this may be a till or petty cash), a merchant account (for taking card payments), a PayPal account, a Stripe account and two directors loan accounts (for Limited Companies only). From here you can add accounts, expand on information in your accounts (to view how the balance is made up), edit/delete accounts and enter new banking transactions, either manually by importing them or using our bank feed feature if you are a Pandle Pro user. To learn more about entering bank transactions using a bank feed click here. To learn more about entering bank transactions using a file import click here. To learn more about entering bank transactions manually click here.